This is a collection of free math videos for pre-algebra level (middle school), showing varied exercises for each topic. They match Math Mammoth Grade 7 curriculum but will also work no matter which curriculum you follow (in other words, the videos don't rely on you having Math Mammoth curriculum). As lesson plans for teaching these topics. Often, one video from below can be made into several lessons with students. Please choose a pre-algebra topic from the list below to view a video tutorial for that topic. The topics below provide an foundation to principles used in algebra (and pre-algebra). 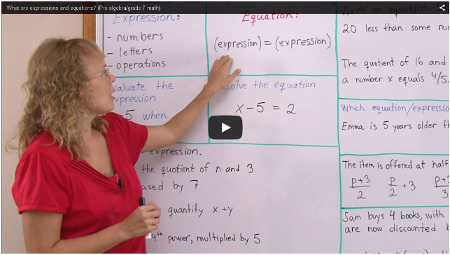 What are expressions & equations? I have not made video lessons for growing patterns, but you can use this Youtube video for starters. However, my goal in putting the growing pattern problems in Math Mammoth Grade 7 is NOT to teach students a mechanical way, but just give them some exposure to thinking of different ways to SEE the pattern, and then try to express it using symbols. So there is no need to learn the mechanical way. The rest of the videos about ratios and proportions are here. These lessons belong to Math Mammoth Grade 7 / pre-algebra course. Other pre-algebra courses may cover different geometry topics.